Do people using food stamps have to get info from the Internet instead of case workers? It’s only 9 days into the brand new year and I have questions. 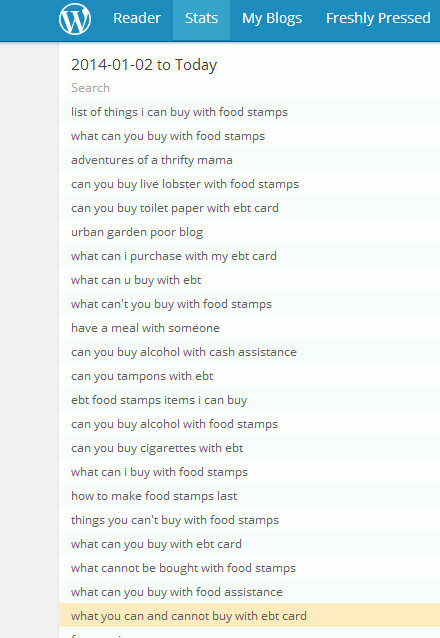 My end of 2013 blog stats told me that What Can and Can’t Be Bought With Food Stamps was the most viewed of the past year. I think I only a lot of those views to Upworthy (thank you so much for your support, Brandon) but it’s more than that. Take a look at this new year’s search terms that have brought people to Poor as Folk. I’m betting the searches for alcohol came from people trying to debunk that myth (I say this because people have told me in the past that’s why they shared that link) but the other searches…. do these people not have caseworkers and a support system at their DSS to answer these questions? So, I’m wondering …how common is my former experience? If you’re receiving assistance ( SNAP or TANF) or have in the past, what was your experience with case workers? Were you giving all the information you needed or did you feel like you had a lot of unanswered questions. Because I realize not everyone wants to comment publicly on something like this, I’ve included a comment for that will go straight to my email. Public comments can still be left by scrolling to the bottom. It would be great if you could also include the state you live in. Also, I’m long overdue for a commenting policy here but just a reminder: when I ask for welfare/food stamp recipient’s experiences, that’s who I am asking. It’s not an invitation for someone to explain all the reasons they don’t think people should get food stamps or why the program is bad or any other derailing commentary. Next Next post: ICYMI: SNAP cuts,Welfare Queens, poverty in suburbia …and a bunch more…. I received food stamps (among other benefits) for about 7 years total. I just recently found employment able to sustain me and my child. During those 7 years, I had about 5 different workers (that I actually saw, the number was probably closer to 10 but some were so short lived that I never met he/she in person). I had one AMAZING caseworker. If he hadn’t been my first real caseworker, I probably wouldn’t have the success story that I do. He helped my family get every benefit available to us including a (very used) laptop and a (older, gas-hogging) car. I include the descriptions not because I am hating on the free help I got but because so many people assume that DHHR’s are handing out the best and only the best for free to poor people (which is entirely untrue). However, I have friends and family members who were blown away when I told them about some of the benefits I received (because their workers never ever mentioned most of these resources/services/items to them). My second case worker took some warming up to. She wasn’t as quick to help, but she also wasn’t “bad”. She was just doing her job. The third was a nightmare. I spent almost a year of my life wasting phone calls, wasting bus trips, sporadically losing benefits, and being talked down to. The fourth was okay, but we didn’t have a lot of interaction. And I felt like I was mostly telling her how to do her job (I was an old pro by year 5, she was a newbie). The fifth one, my most recent, was pretty good. She didn’t stack up to the first, but was just a little better than my second worker. However, my sister in law had the same case worker and she treated her like dirt. I feel like this is because I was so close to my goal (Bachelor’s degree, job and ultimately, hopefully, self-sufficiency) and my sister in law hadn’t made what the DHHR considered tangible progress. All in all, I feel like I was given all the information I needed, but I know this is because of the amazing first worker I had. Most people I know that have gotten help here (I’m in West Virginia by the way), were left with many unanswered questions. And everyone (including me) found it almost impossible to get a timely response from almost any worker that we’ve had. Also, one of my last visits to the welfare office resulted in a random caseworker who I spoke with telling me that there were way too many people employed there that really didn’t like their jobs and looked down upon the benefit recipients. The entire system is completely screwed up. And I spend at least a few hours every week defending people that receive public assistance which is very tiresome. I don’t understand why it’s so hard to acknowledge that most people receiving assistance really need it, and those that can, do end up working in the end and becoming a bit more self-sufficient (even if it isn’t full self-sufficiency). Oh, I just want to clarify that although my last case worker was good to me, I don’t think it was fair at all for her to treat my sister in law so badly because she wasn’t “making progress”. Sister in law could have probably tried a little harder, but she was newer to the game and didn’t have all the resources I did. The caseworker could have given her more resources to try to improve her life, but she didn’t; she judged her instead.